This third verse of 1 Corinthians may remind you of many of Paul's other letters. With good reason. It is similar to Romans 1:7b, 2 Corinthians 1:2, Galatians 1:3, Ephesians 1:2, Philippians 1:2, Colossians 1:2b, 2 Thessalonians 1:2, 1 Timothy 1:2, 2 Timothy 1:2, Titus 1:4, and Philemon 1:3. What is God trying to remind us of that He prompted Paul through the Holy Spirit to write about it more than ten times? What is grace? Grace is unmerited favor. It means receiving something we do not deserve. It is receiving blessings beyond number from a Holy God. It differs from mercy in that mercy is not receiving the bad that we deserve. Grace is receiving good that we have not and cannot earn. Grace is the gift of forgiveness coupled with blessing. Mercy is escaping our destiny in Hell because of our sin. Grace is receiving the gift of eternal life and the promise of eternity with God. Grace is so important because only God can give it to us. I believe God prompted Paul to write so extensively on Grace because we have such a difficult time believing that God would love us. Such a hard time believing that anyone, much less a Holy God would want us after all of our failings, all of our sin. We are so used to failing that we know we can never measure up to God's standards. That us true - we cannot - but Christ can. Grace is us getting such a huge blessing in exchange for what Christ did on the cross. Nothing we deserve, but everything we need. What about peace? It is tied into the source of peace - God the Father and the Lord Jesus Christ. Only God can grant peace. It comes from a relationship of trusting in Christ. A peace that truly passes understanding. Unless Jesus Christ is your Lord, you will never find peace. What the world offers us is temporary happiness tied to things or experiences. What God offers is lasting peace, inexpressible joy, HOPE. Peace is the offering of a secure future, an eternal future. One where Christ reigns as King, and every tear is wiped away. 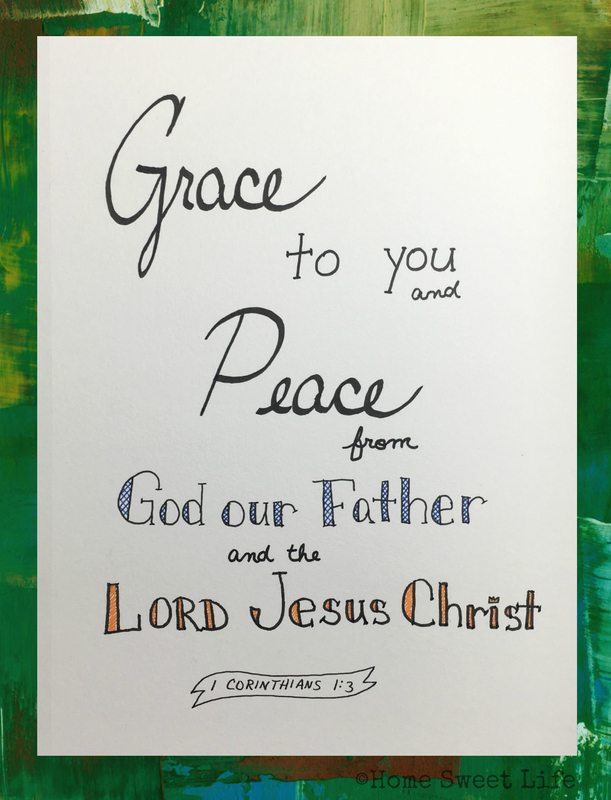 The world around us is hurting because it lacks both grace and peace. Are you lost today? Lonely, without hope? Christ will not force you to accept Him as Lord. It is a gift - this offering of grace. You must choose to receive it. Lay down your burdens, come to the cross of Jesus, and tell Him of your need for grace, forgiveness, and peace. Unmerited favor, unending joy, hope, and peace await you. The picture drew me in... I love the lettering you did for this piece. the reminders in your post where a reminder to my soul. Thank you.